Four COM student nurses, COM electrician Lorrin Ching and COM Police Lt. Jill Hamm helped save the life of Gary Glover, who was electrocuted on Sept. 19., and are being recognized on Oct. 16 with the first ever COM Distinguished Service Award. 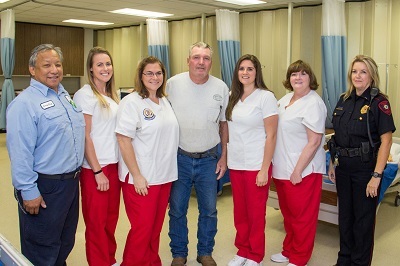 Pictured are (l-r) Ching, student nurses Rachel Cunningham and Shanee Scribner, Glover, student nurses Alexis Boettcher and Andrea Strickland and Hamm. The four student nurses - Alexis Boettcher, Rachel Cunningham, Shanee Scribner and Andrea Strickland - rushed to the grassy area where Glover was, found he did not have a pulse and took over the compressions on Glover’s chest. Strickland called COM police on her cell phone requesting an Automated External Defibrillator, or AED. COM Police Lt. Jill Hamm arrived a short time later with an AED that is kept in the COM police cars. She followed the verbal instructions on the AED and was able to apply the pads to the man’s chest to help get his heart into rhythm. The nursing students continued with heart compressions after the AED was used and Glover eventually responded. The student nurses, Ching and Hamm will each be presented with the first ever COM Distinguished Service Award on Tuesday, Oct. 16 during a noon ceremony in the LRC breezeway. “I honestly believe God put us there for him. He was blue and had no palpable heartbeat, he was going. I'm blessed to have been there for him that day. It is still unfathomable what happened but like I said, God put us there and I am so grateful Gary is still with us." The nursing students were given a 15-minute break instead of the usual 10 minutes; otherwise they would not have had time to visit the financial aid office. The students had been reviewing the specific scenario/content in class that day.